The management of opioid responsive, moderate to severe pain. 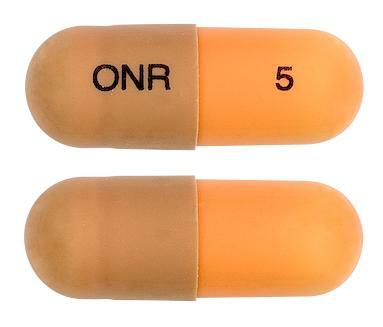 Size 4 orange/beige opaque capsules printed with ONR and 5 in black ink. Size 4 pink/beige opaque capsules printed with ONR and 20 in black ink. Size 4 white/beige opaque capsules printed with ONR and 10 in black ink. Clear, colourless solution, practically free from particles. INDICATIONS: The management of opioid responsive, moderate to severe pain. Clear, colourless to pale yellow solution, practically free from particles.